Your YouCanBook.me account can be integrated with Stripe, to allow your bookers to make a payment before the booking can be completed. The process is simple - your booker simply enters their card details into the secure form - and it's a great way for you to help reduce no-shows. Now, connect your Stripe account. 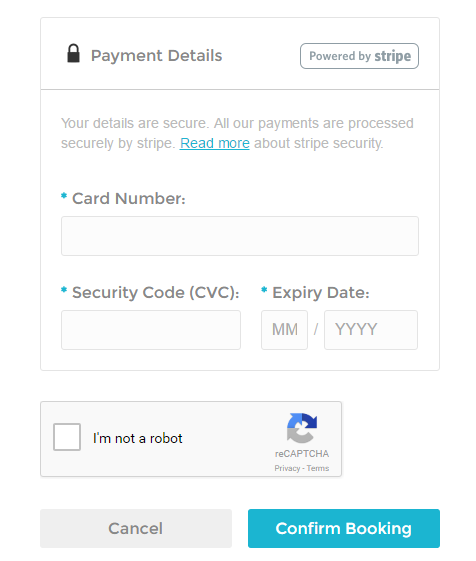 If you already have a Stripe account, click "Sign in" in the top right of the screen. If you need to create a new Stripe account, complete form and click Authorize access to this account button. 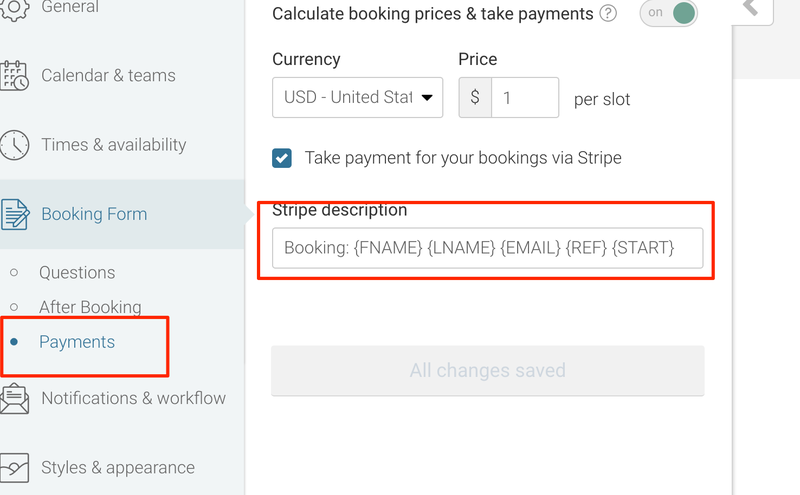 Set the currency and price for your bookings, and create the description that you will see on your Stripe statement using Shorthand Codes. Note: If you have our Appointment Types feature enabled, you can set your prices for each appointment Type on the Times & Availability > Appointment Types tab. When your customers select a time to make a booking with you, they will be taken to the booking form, which will include a secure form where they must make their payment prior to their booking being confirmed. Is there a minimum I can charge my bookers? Stripe does set a minimum charge for each transaction. It varies by country - see more here. What if my booker enters an incorrect card number, or their card has expired? If there is an error with the card, your booker will see a message directly from Stripe about what might be wrong and how they can fix it. Are there fees for using the Stripe integration? Stripe does charge for taking payments, but they have a very competitive and simple charging mechanism. See Stripe's pricing page here for full details. In addition, YouCanBook.me takes a 1% commission for each payment you take. Can I use a test credit card number to test my Stripe Integration? Unfortunately we don't support a sandbox testing environment, so there isn't a way to test Stripe, besides using your own payment card, and then refunding it via your Stripe dashboard. How are refunds handled? If someone cancels their booking, are they automatically refunded? If someone cancels a booking they have paid for through YouCanBook.me, any refunds would need to be done through your Stripe account dashboard. You can read more about how to do that on this page. While Stripe will automatically refund all (or some) of their transaction fees, unfortunately their system is currently unable to automatically refund YouCanBook.me's 1% commission charge. In the future, we hope this will change, but at the moment this commission charge is therefore non-refundable. What if Stripe isn't available in my country? Stripe is working hard to roll out across the world, but it's not quite there yet. It is currently available for customers in these countries. How do I charge sales taxes on my bookings? When making charge requests, Stripe does not calculate any tax information for you. The amount you specify in the Booking Form > Payments must be the total amount to charge the customer, inclusive of any fees or taxes that they should be charged. Can I offer a discount or voucher codes? At the moment it's not possible to take part payment and then charge a card later. You would need to set the full price in YouCanBook.me to be the deposit amount, and then you would manually charge the customer at the later point. We also don't support vouchers or coupons. We are looking at this as an area to develop but at the moment we don't have any plans to add them in the short term. What if I haven't received payment? Stripe collects the money and handles the financial aspect of the booking. You can keep track of payments and refunds by logging into your Stripe dashboard: https://dashboard.stripe.com/login?redirect=%2F. It may take up to 7 days for the first transfer to occur direct into your bank account.